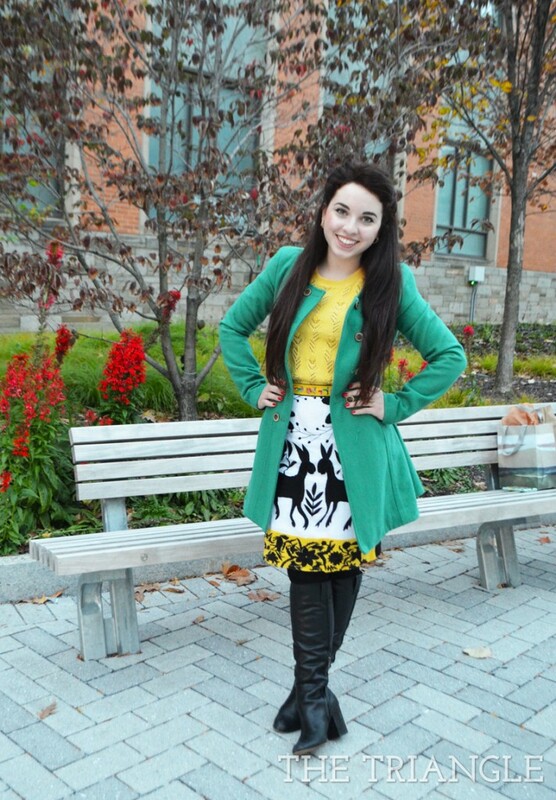 Wearing: Red Valentino top, Anthropologie skirt and jacket and Sam Edelman boots. The Triangle: Do you have a style icon or anyone in your life that influences how you dress? Rhyan Kelleher: I love vintage, so my ultimate style icons are Jackie Kennedy and Audrey Hepburn. TT: Do you have any trends in mind that you will be trying out this winter? RK: I really like the plaid blanket scarves [trend] that I keep seeing all over Pinterest. They look so cute and cozy. I work at Anthropologie and we have a couple in the store right now that I’ve had my eyes on. TT: Has studying design and merchandising changed how you shop or dress? RK: Yes! My style has transformed a lot since I started at Drexel. I used to buy a lot more clothes, but they were lower quality and never lasted long. Now I buy things much less frequently, but when I decide to buy something, it’s an investment. I would rather have a smaller but higher quality wardrobe with pieces that I’ll have for a long time. TT: Can you describe your style in three words? RK: Classic, vintage and a bit eclectic.